Bassenthwaite Lake, the only official lake in the lake district, with Skiddaw (3100ft) on the left. Pictures from up Skiddaw, which I haven't done yet, coming soon. It's been a funny few days, after going home, training, parties and family gatherings, then bringing my Dad back to the Lakes for a few days R+R, I've had trouble getting any training in. Every other day this week, doing the fast twitch exercises my coach set me. I'm doing my hilly 8.5 mile circuit, but on the downhill sections, getting down to 7 to 8 minutes a mile for a few hundred yards, legs and arms going as quick as I can, push the heart rate up, and then back down to 11 minutes a mile for 5 or ten minutes. Doing this sets the muscles aching for a couple of days afterwards so walking round the Lakes with my 80 year old dad keeps me down to his speed. I managed my 8.5 mile circuit this morning using this method in 1hr 32m, which is a good 4 minutes faster than my personal best for this hilly circuit. that was 6.30 this morning and my quads and hamstrings are still aching so it might be a good idea for a steady 5mph walk over the 6 mile circuit tomorrow then rest until the 10k Northern Championships on Sunday, plenty of protein and stretching. I haven't really taken 3 days rest in a row for a long time so it might be beneficial. Mind you, it's 3 days to the next race, Dad goes back to the island on Friday, and it's supposed to get sunny. I've never been one for taking my own advice so it will be a struggle not to get out for some walking. Still, fitness is looking good, and I have to work on speed, technique and heart rate, which isn't easy to do when your muscles are aching from over-training. 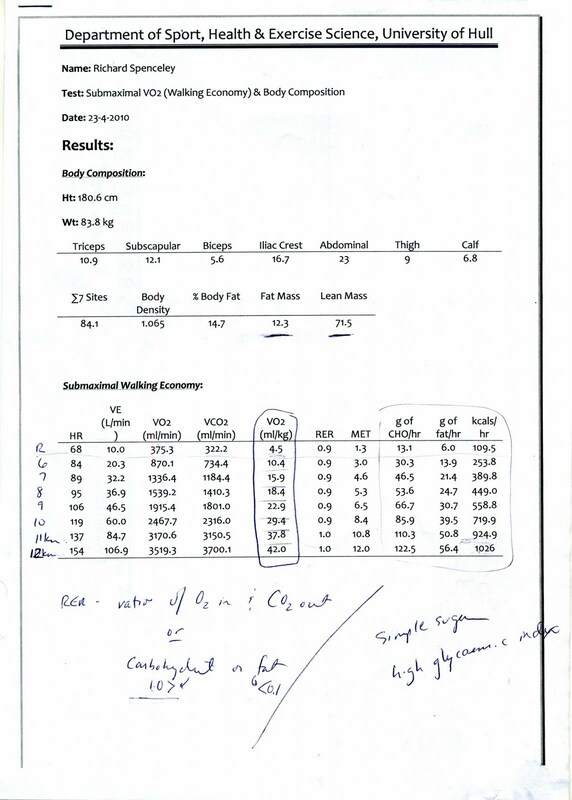 Above is the graph from last years initial session in March at the University sports department. The upper graph shows how much the heart rate increases the faster you go. It was walking on a treadmill with all wires attached and oxygen mask measuring volume of oxygen taken in and volume of Carbon Dioxide exhaled. 5 minutes at each speed and a blood sample taken between speed increases to check lactic acid levels. The upper graph is self explanatory, the faster you go, the faster the heart rate. You eventually reach a speed where the heart rate increases much more rapidly, which is the Lactic tolerance level, when the blood cannot clear the waste and oxygen depletion starts. 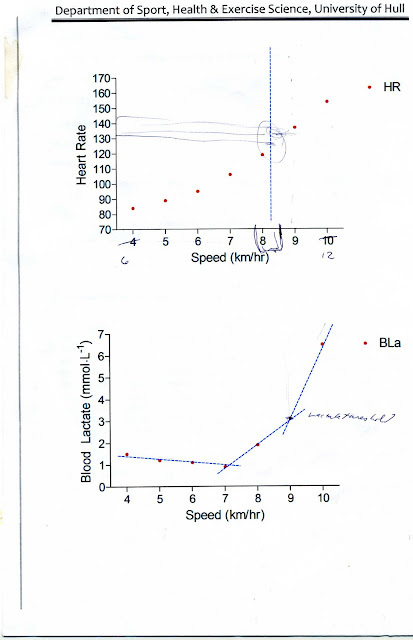 This is shown in the second graph, the blood lactate initially drops as the increased Heart Rate flushes it away quicker, then it increases as the start to build up, then increase dramatically at the lactate tolerance level. We all have this level, it's just a case of knowing where our own is and what to do when we reach it. I have written earlier in the blog about how to recognize it. The oxygen cannot get to the aerobic muscles as they are filling with waste faster than the heart can clear it. It escalates, and if you keep on pushing, you'll burn more and more calories just to keep going. Gasping for breath (as the body just knows it needs more oxygen, but not why) burning muscles and eventually dizziness, they all mean you have to slow down. You can make up the time later when you've recovered. It just shows that up to 9 kmh, my lactate tolerance level last year before picking up training, Oxygen (VO2) in was less than Carbon Dioxide (VCO2) out. Afterwards it was burning every bit of oxygen it could get. when the RER, (respitory exchange ratio) hits 1, then you aren't getting enough oxygen. As it passes through that level, the g of CHO/hr, the grammes of carbohydrates per hour consumed, rise rapidly, meaning you need so much more food to keep going. Between 8kmh and just over 10kmh the rate doubles. this is the same for everyone so keep the speed down to burn less food when you reach this level. between 8kmh and 11kmh the fat per hour doubles, so if you want to lose weight, lots of Cardio work! Between 8kmh and 11kmh, the calories burned doubles. So, before the Parish, push yourself up hills till you're heart rate is pushed, as this makes your heart stronger and more likely to clear the waste from the muscles and carry the fuel round. Keep hydrated, as the blood is mostly made up from water and if it's lacking in this water, then it's thicker and harder to circulate. If you just want to get to your personal goal, or even complete the Parish, then a little Cardio, some long distance work to prepare the muscles, and lots of stretching prepare the muscles for lots of fuel in and waste out. If you're aching after a long training session, then rest and let the damage repair. Training isn't fun with damaged muscles and it may even put you off training in future, and try to get plenty of protein to help repairing them. Nuts and seeds, pumpkin seeds and sunflower. Tuna, sardines and other oily fish. or, a nice peanut butter sarnie! Now a recipe to get all of them in.... it's called Cheesy tuna chicken soya peanut butter stew!